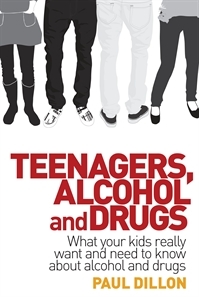 Teenagers, Alcohol and Drugs was released in February 2009 and was written in response to the stories Paul Dillon has heard over 25 years in alcohol and other drug education. It provides answers to the questions he has been asked by both young people and their parents and also includes solutions to the many scenarios he has heard about from anxious teenagers who haven’t known what to do when things went bad. This book shows parents how to talk to their children in a way that is respectful and reasonable, non-threatening and non-judgemental. It will help them understand the issues their children are facing, and show them how to help their kids negotiate a minefield of misinformation and social pressure in a calm and sensible way to tell them what they really want and need to know about alcohol and drugs. To read an extract from the book or to purchase a hard copy please go to Allen & Unwin or try the iBook at the iTunes Store. A full list of Paul Dillon’s publications is also available.